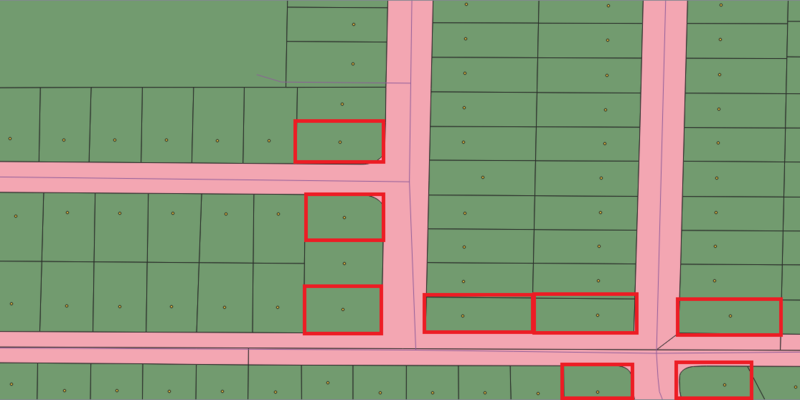 I use QGIS to manually identify polygon parcels with street corners (street junctions) on them. I would like to know if there is a plugin or algorithm to provide such a solution to identify all parcel polygons that are on street junctions. That is those polygons that are on the corner of the street line. For example, the parcels mark in the red box below have corners. So, they are selected for export. This could be done a manual visual inspection of the parcels. However, I am looking for an automated in QGIS. Performing st_intersects without a spatial index is super slow, better to create a new indexed buffer layer and use that. You probably want endcap=flat but should experiment. Not the answer you're looking for? Browse other questions tagged qgis postgis polygon parcel or ask your own question. How to find the location of parking areas in OSM with QGIS?